This year was my first time attending PAX East for the full three days. Last year I attended just on a Friday, due to the other badges being sold out. It was overall a very good experience and much different from my recent trip to MAGFest. I did attend a few panels at PAX East this year, but a larger portion of my time was spent at the Expo Hall looking at new and upcoming games. There was a lot of things to do at this event, to the point that I had to make some tough choices about what I wanted to go see. In any case, here’s a brief summary of what I saw at PAX East this year. The first event that I attended was the PAX Keynote and Penny Arcade Q&A. Cliff Blezinski was the guest speaker for this years keynote. Blezinski told a story about his experience with games growing up, how they influenced him, and the importance of separating our fantasy worlds from reality. Among other things, he expressed his disappointment with the media’s portrayal of video games and the gaming community. In particular the false assumption that video games cause people to develop mental problems and behave violently. He spoke about the great community of the games at PAX and other gaming conventions. He specifically noted that if the accusations of gaming creating hostile individuals was true, we would see many instances of violence and aggression at these events, which there rarely are. Overall, a fairly good keynote address that covered some important issues that the gaming community is facing and provided some insight into the life of one of the industry’s creative minds. 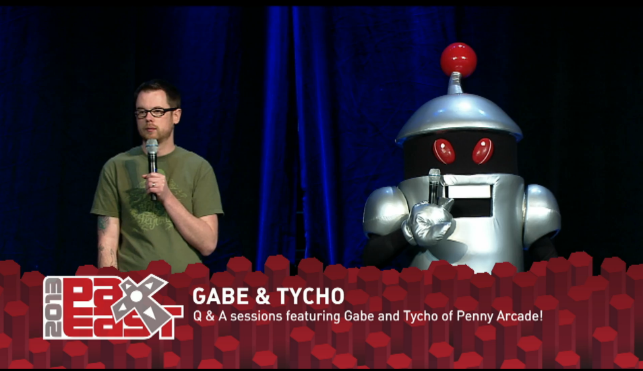 Following Blezinski’s speech Mike Krahulik (Gabe) and Jerry Holkins (Tycho) emerged to do their first Q&A session for this year’s PAX East. This year featured Jerry dressed as one of the Penny Arcade characters. Audience questions ranged from advice on Dungeons and Dragons to questions on the future of the Penny Arcade site and the expos. As with most Q&A sessions at PAX, there were some audience members who came forward to tell heartwarming stories about how the Penny Arcade community had helped them or someone close to them. There was also a good mix of comedy skits and off the wall questions submitted to the Penny Arcade hosts. This was my first time attending one of their Q&A session. I didn’t go up to ask a question myself, but it was fun to be there in person and participate in the audience shenanigans. The next panel I went to on Friday was the “It’s Dangerous to Go Alone – The Take This Panel”. The panel was not focused on The Legend of Zelda as the name might imply. This was a panel on gamers and gaming professionals dealing with anxiety and depression. Several members of the games industry shared their personal experiences of fighting with and trying to function with these crippling afflictions. Some important issues that they brought up included the stigma that surrounds mental health problems and the difficulty of relating the suffering that you are experiencing to others. As someone who has a history of dealing with anxiety and depression, these discussions and stories were something that I could relate to. Susan Arendt’s story in particular paralleled my own experiences. Her descriptions of dealing with anxiety and the struggle to help others understand what you’re going through gave me chills, because it was so close to my own personal struggles. She described the sleepless nights where your mind races with the details of everything you did during the day, the endless analyzing of everything you’ve said and done, and the sudden rushes of panic that get triggered by the smallest daily events. It was a very moving and intense experience for me and other members of the audience. A large number of us thanked the panel members for sharing their stories. It helped to know that we weren’t the only one who suffered this way. It was depressing to hear that others faced these problems, but at the same time comforting to know that there are others out there who understand exactly what it’s like. These are issues that need to be addressed more in society and I’m glad that the Take This group exists to help offer discussions and share experiences with people. It was definitely an emotionally difficult panel to be at, but I felt I got a lot out of it. I highly recommend that people check out the Take This website. One of the last panels I went to was titled “Twister Tales: Breaking Into Gaming & Partying On”. The panel featured several producers and CEOs discussing ways to market yourself and get into the industry. A lot of it was very basic information for anyone starting up. Go to conventions, meet people and make connections, and know how to market your abilities. One piece of information that surprised me was that many of these producers had encountered people who didn’t even have business cards or online portfolios set up. A lot of this seemed like very simple stuff that the average person could figure out on their own, but I imagine it was helpful to people who needed some direction to get started. One method of getting into the industry, that some people still seem to use, is starting off as a game tester. I’ve heard some horror stories from people about attempting this, and I’m not sure that’s a path that I want to take. It may get your name known within a company, but I don’t like the idea of working in a department that I’m not interested, just for a slight chance at getting into another section of the industry. After the panel, I went and talked with some of the members about what I had been doing with music and audio. They told me I was definitely on the right track and to just keep at it and keep improving my skills. I didn’t attend many other panels at PAX East. A majority of my time was spent on the Expo Hall floor looking at games and chatting with developers. I definitely felt like I had to weigh my priorities a lot more for this convention more than I did with MAGFest. There’s always a lot to do, so it’s always an issue of deciding where to invest my time. I spent a good chunk of Saturday and Sunday wandering around the booths in the PAX East Expo Hall. The area features vendors, table top games, console tournaments, and of course game developer booths. All of the big AAA companies were there with their demos, but there were also a lot of Indie developers present at the convention’s Indie Megabooth. Most of my focus was on the Indie developers for a few reasons. The first being that they are what I’m currently more interested in. I still enjoy the big AAA game titles that come out each year but it’s the smaller independent games that I seek out, because it’s always a pleasant surprise to see what they are creating. The other reason for focusing on the Indies, is that their lines are much shorter for playing the games, if there are lines at all. So while I really wanted to try out The Last of Us, I was not prepared to stand in a line for 3 hours to play a quick demo. Even with the shorter wait for the smaller games, it was impossible to see and experience everything that the Indie Megabooth had to offer. So for what it’s worth here are a few of the games that I did get to try out. First up, Legend of Dungeon. A multi-player rouge-like game, where you and your friends fight through a randomly generated dungeon. The game is still in its early Beta, but you can pay for it now and have access to the Beta, final release, and the expansions that will come out later. It’s planned to be out for Windows, Mac, Linux, Android, and Ouya. The game looks great from what I’ve played so far. I’m especially fond of the pixel style for the characters and items. They are also looking to get the game on Steam through Greenlight. Definitely go give this one a vote. Compromised is a bullet hell space shooter. The game features a single player campaign mode, shown in the trailer, a co-op campaign, and a competitive multi-player mode. I got a chance to play through the co-op campaign with three other people. Unlike space shooters like Ikaruga, you can fly around freely in the game area and change flight direction. Your weapons can fire independent of the direction that your ship is facing, allowing you to dodge attacks while firing at enemy and boss weak points. The game was a complete blast. Highly recommended if you are a fan of the genre. Compromised is currently available in Beta on the PC and the single player mode is currently available on XBLA, with other modes set to come out later this year. With all of the zombie games that have been coming out this year, you would think developers would have run out of ideas by now. But Ray’s The Dead brings some fresh ideas to the zombie craze. You play a zombie, named Ray, who has the ability to lead other zombies on a mission to increase their numbers and eat the brains of the local townies. During the demo you learn to command zombies to attack fresh prey to turn them into members of the living dead, effectively adding them to your ranks. The game also introduces the concept of stealth and strategy into the gameplay. This zombie infestation happens to be occurring on Halloween, so the locals don’t realize you’re real zombies. So the plan is to stealthily pick of unsuspecting victims, while avoiding dogs that can sniff you out and expose you as the real deal. This includes setting up ambushes and sneak attacks and controlling your growing group to avoid being discovered. Ray’s the Dead is another game looking to be Greenlighted on Steam. Be sure to keep your eye on this one. Supergiant Game’s Transistor was something that I was looking forward to trying out at PAX East. Even when I got on the Expo floor at the very start of the day, it was over a two-hour wait to try this game out. But it was well worth it. The game is set in a cyberpunk city with an art style similar to that of Supergiant Game’s previous game Bastion. The game protagonist is a young singer simply referred to as “Red”. Red is attacked by a group of strange robotic assassins and comes into possession of a weapon called the Transistor. From what the demo showed, the Transistor allows you to absorb the souls of people who have died, allowing you to acquire new abilities and powers. These abilities aid you in combat and in solving puzzles. The battle system allows you to pause the action and map out your movement and attack patterns. You have a meter that is drained for each action you set up, giving you a limit on what you can do in one attack phase. After you execute your movement you need to avoid enemies and find cover while the meter refills. This mechanic was also needed to solve some of the puzzles you encounter. The demo was about 10 minutes long but gave a good preview of the gameplay and the setting. The game will not be out until 2014, but it looks impressive so far. So that was my first experience of a full three days at PAX East. It was a lot of fun but it was incredibly exhausting. There was so much to do that I felt that I barely got to experience everything that I wanted to. It was great being able to meet the developers and try out their new games. I didn’t go to as many panels as I did at MAGFest, but the one’s I did get into were very informative and valuable to my experience. I plan on going next year, assuming I can snag the three-day pass again. I may also be attempting to go to GDC next year, assuming I have the funds. It will be interesting to see how well my stamina holds out trying to do PAX East and GDC in the same week. If you are a gamer and have never been to a PAX, you should definitely go at least once. It’s a great experience and you meet tons of cool people. It’s well worth the trip. Greetings everyone. I’ve recently returned from my trip at PAX East. It was my first time attending for the entire 3 days and I’m still feeling exhausted. I made some new connections, met some great people, and had a fun time. I’m still in the midst of processing everything that I experienced there. I’ll be posting a summary of some of what I saw in did in a few days, but for now I’m getting myself organized for the next set of craziness that I will bring upon myself. I am not going to GDC this year but it’s something I hope to do next time. I honestly can’t imagine how people manage to attend PAX East and then immediately head out to GDC without collapsing from exhaustion. Those of you that do, you are an inspiration and I wish you the best of luck. So like I said, there will be a write-up later on the events of PAX East, but for now I’ll be recovering and trying to get myself back on schedule. After this trip I’ve decided to go ahead and start working on some changes to this site. I’m planning on creating a home page rather than using the blog section as the main page. This is something I’ve always planned on doing, but now seems like a good time to start looking at implementing it. Another change will be the Video Game Music section. I’ve featured two pieces I wrote on that page as a set of samples of my work. My original intention was to continue to add pieces on that page, as a digital portfolio for my work. That plan was derailed by other projects, including a game soundtrack and work on my album. So I will be making some efforts to beef up that section and create some more demo tracks. Primarily, I want to get a wider variety of my writing capabilities shown. I primarily write orchestral music, but I also mess with experimental and electronic music genres, so I’d like to get a fuller representation of my composition pallet up on display. This will most likely result in my original album being put on the back burner for now. I’ll still continue work on it, but I feel this is a needed shift in priorities for me. I will probably be looking at reworking some of the other sections of the site, but I’ll see how the rest of this goes. So look forward to seeing some more content and some changes on the site. There will be a PAX East post up soon, but in the meantime, I’m going to get some rest and get ready for the days ahead.